Being a Blink-182 fan since Enema of the State, there’s no question I was heartbroken about the band’s 2005 breakup. But each member would continue making their own music. Me being the supportive fan cheered for Mark, Tom, and Travis even if they were doing things separately. 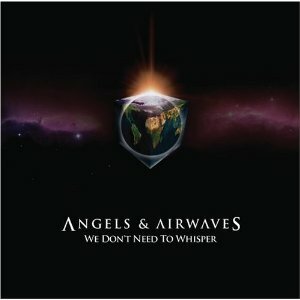 Though I was a fan of +44, I never got into Angels & Airwaves. I loved the debut single, but after that, I grew disinterested. With the recent Blink-182 drama, it made me think back to the initial break up and when I actually listened to AvA. So I decided to give their debut album another shot to see if my opinion of the band changed. When AvA first debuted, I never believed Tom’s claims about the band changing the face of rock music or starting a revolution. But I still gave it a chance since he was my favorite Blink member. I never really got into the entire album, but I loved the first single “The Adventure.” It’s a song I haven’t listened to in recent years, but revisiting it I discovered I still actually like it. It’s catchy, upbeat, and has a cool spacey guitar riff reminiscent of The Cure. The mechanical noises in the background even sound like early Depeche Mode. It also has a positive message about no matter how much pain you’re in everything will be fine in the end. It’s one of the strongest songs on the album and the most interesting. Another surprisingly strong track is “The War.” What makes this song so refreshing is the energy behind it. As soon as the track opens with thudding percussion and somewhat corny handclaps it grabs your attention, something most of the other songs fail to do. The music, which features DeLonge’s classic guitar playing, is more intense and aggressive. It wakes listeners up after so many mellow, slower moving songs. I also didn’t mind “The Gift.” It’s pretty catchy, the music perks you up, and it’s pretty engaging even if Tom’s singing isn’t the best here. Aside from these songs, the rest of the album is just okay. Songs like “Distraction,” “Do it For Me Now,” and “A Little’s Enough” don’t really have anything notable about them. I didn’t find them exciting, energetic, or upbeat. A lot of them were too slow for my taste and grew old really fast. A big part of is is AvA is more prog rock, a genre I’m not heavily into. While I didn’t think the songs were terrible, I could only stomach them for a little while. There’s just nothing drastically unique about these songs. Very little about the album is memorable aside from the one song I knew about before I listened to it. The most I can say is a handful of songs have positive messages. Though it’s kind of cheesy “Good Day” is exactly what the title says, finding the good in everyday life while “Start the Machine” is about leaving a city in flames and discovering a utopia. There are also several songs looking at the bad battles can bring like “The War.” It’s fine that DeLonge wanted to expand his horizons and tackle different subjects, but they’re not the best written songs. Rather he sounds like a high school student who’s too optimistic about changing the world. Then again he never was the strongest songwriter. It’s clear DeLonge has larger than life ambitions as he shows with these songs and it’s great that he wanted to pen them. Even if you don’t like the songs, you can admire them for the issues they try to discuss. So do I hate the album? Not really, but it’s not something I would listen to whole again. While there are a few interesting songs most of the album was just okay to me. Some of the songs were too slow for my taste while others were so easy to forget. It’s not a record that holds my attention for very long. After listening to it once I was bored with it and didn’t want to hear it again. But that’s just me. I’m just not an AvA fan. And it has nothing to do with DeLonge’s involvement with recent Blink drama. It just wasn’t my style.